As one of the most picturesque places in the Pacific, Treasure Island is the perfect setting for any romantic getaway or couples holiday. Its also one of the resorts of choice for a destination wedding in Fiji. Whether it’s just to spend some time away as a couple, get married in paradise, celebrate an anniversary or reconnect, look no further than Treasure Island Resort Fiji. Weddings are our specialty! Choose a more formal setting with our masterfully designed glass and marble (non-denominational) Sigavou Chapel that offers panoramic ocean views or go barefoot on the beach in a simple yet stunning wedding ceremony to the grandeur of Fijian warriors, drums, canoes. Our professional weddings team set the tone and atmosphere by everything you need them to do so that you can have your perfect destination wedding in Fiji. Choose to celebrate your wedding at Treasure with an intimate ceremony with just your partner or have friends or even a family and larger group. The choice is yours, we just make it happen. There are not too many people that have not dreamt of getting married on a beautiful white sandy beach with turquoise waters as the backdrop. If you’re one of those that have always dreamt of a beach wedding, there aren’t too many better than having one at Treasure Island Resort. Weddings on our white sandy beach is definitely some of the most stunning experiences. Our wedding team will help you choose the best setup for your wedding on the beach. Our chapel with its stunning panoramic views of the surrounding ocean is another favorite spot for weddings. The uniqueness of the Island and its beautiful backdrop makes the ‘Sigavou’ chapel wedding one of the most sought after. Let us help you make your day one to remember. When you’re left to choose between a beach or a chapel with the South Pacific ocean as your backdrop, there is hardly anything that beats that. 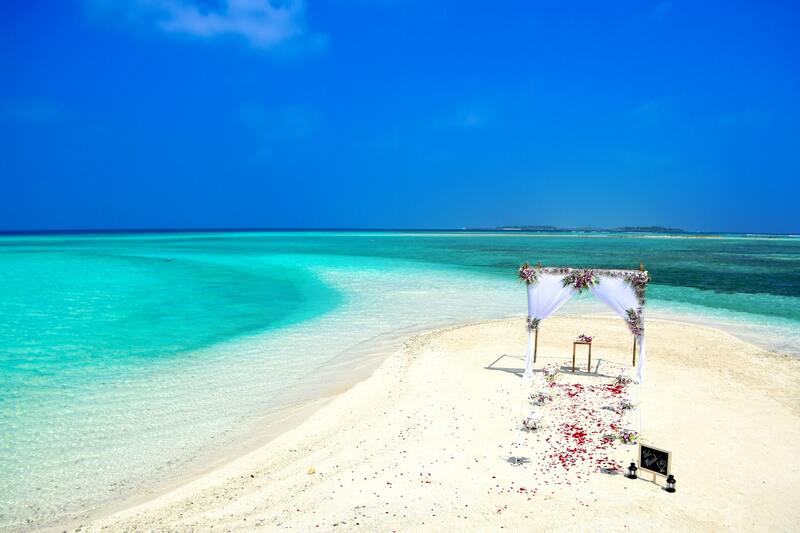 Choosing the best destination wedding package should not be something stressful. Here at Treasure Island, our affordable destination wedding packages are sure to get you closer to your dream day. With a number of dining options available at Treasure Island, you are spoiled for choice. Choose a beach setting or have your wedding dinner poolside under the stars. Just choose your favorite spot on the island and we’ll do the rest. We’ll take care of everything down to the finer details – decorations, choir, fireworks, private candlelight dinners and more. Leave it with the best weddings team in the Pacific to help make your wedding day a dream come true. Finding the perfect moment and setting to pop the question is what we do best. Do it by the beach at sunset, on our sandbar or even enlist the help of our serenaders and staff to truly make it an unforgettable moment. Why wait when you can go on a honeymoon before your wedding. A pre-honeymoon allows couples to take some of the stress off wedding planning and allows you to get closer. Come over to Treasure Island for your pre-honeymoon. If you’re looking to renew your vows in a private intimate ceremony in front of family and friends, we have just the perfect options for you to do that. We pride ourselves in making dreams come true.